If you have multiple locations or you’re a property manager, you want to find a sign company you trust to handle your signage. Hustler Hollywood has many locations throughout the United States, and we’ve done interior signage for about a dozen stores. Their Sunset location is moving buildings, and they were in need of signage to advertise the new location. Some may not know that Hustler Magazine was originally published by Larry Flynt in 1974 to promote his clubs, Hustler Club. The magazines were a success and almost half a century later, they are still in circulation. Hustler has grown as a brand over the years with Hustler Casino and over 20 retail stores nationwide and counting. 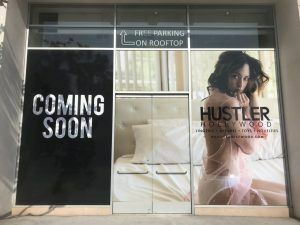 Hustler Hollywood in West Hollywood is the first location and there are several more locations in California alone. With such an iconic brand in an iconic city, they wanted to make sure that their new location was advertised well. The store is not moving far, it is just up the block and across the street, so the window graphics will be seen easily from the street by anyone driving or walking by in the neighborhood. To make these graphics, we digitally printed the high-resolution image provided by Hustler onto removable vinyl and laminated the print for UV protection. As we do a lot of interior signs for them that are large prints, we are experienced in printing their large artwork. The only difference with this sign was that we used removable vinyl and the vinyl was being applied directly to the windows rather than a backer panel to be installed on a wall. Removable vinyl graphics are a great way to advertise your new location before your storefront sign is up, or if you are advertising something temporary like a seasonal sale or promotion.